How many speeches to give to showcase your particular expertise. 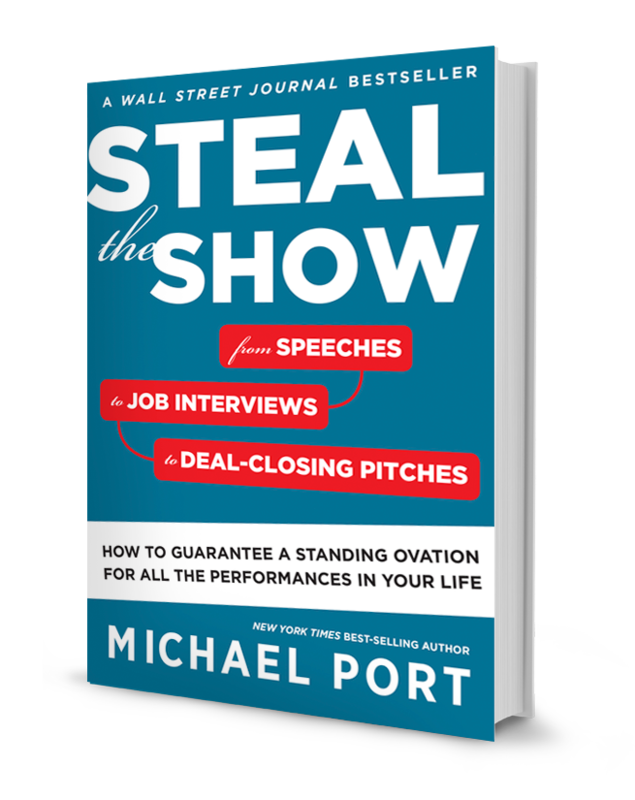 00:01: Welcome to Steal the Show with Michael Port. This is Friday’s Fan Mail: Questions and Answers. Common questions and sometimes, comical answers. I’m gonna answer three questions today. That’s three questions. And hopefully, at least one of those questions will be relevant to you. 00:20: So, Isabella Brusati, I hope I’m pronouncing that correctly. She is from Brusati Consulting. And she wanted to know: “What is the best way to get the buy-in of a skeptical executive when making a presentation of a business issue that she has to address?” So, what is the best way to get the buy-in of a skeptical executive when making a business presentation? 00:43: Okay. When somebody considers your idea, there are three things that they consider and if you get a “No” to the first, you don’t get any further. If you get a “Yes” to the first, but you get a “No” to the second, you don’t get any further. If you get a “Yes” to the first and a “Yes” to the second and a “No” to the third, you don’t get any further. And of course, I think you get the point, if you get a “Yes” to the first and a “Yes” to the second and a “Yes” to the third, then you get a “Yes” to your idea. 01:17: So when you’re making this presentation make sure you’ve worked out going in there, number one: “Why the idea is gonna be successful? Why does this work?” You first need to demonstrate that, because if they go, “Hmm, I don’t really think this makes sense, I don’t really think this works, It’s not logical.” or, “I just don’t really get it,” then you’re not gonna get a “Yes,” on that particular question. So if you get a “No,” then they’re not gonna listen further, but if they go, “Hmm, you know what, that makes sense. I think that would work.” Then they’re gonna ask, “Is this worth my resources, my time, my energy, my money?” Whatever you’re asking of them, and if the answer is “No,” then, of course they think, “Well, it’s a good idea, it could work, but it’s not really for me.” And you don’t get to go any further. But if you get a, “Yeah, you know what? It seems like it would work. It seems like it would be worth my time.” The third thing they wanna know is, “Well, is this person able to champion this idea? Can they lead and run with this idea? Are they the one that should implement it? That I should give a ‘Yes’ to?” Or “Is it a good idea that could work that’s worth my time that I should have someone else execute on?” So make sure all those three things are in place before you go in and make your presentation. That’s number one. 02:45: The second question, second question. I’m actually reading this right off Facebook, I said, “Hey, so what questions do you have and I’ll answer them.” So here’s one from another really tough name, I apologize if I just destroy this name, Ger Van Der Meijden. So Ger, Ger says… And he’s from… He says he helps healthcare professionals with their own practice to get more clients. Very cool. And he lives in the Netherlands. So he says, “How and when to deliver your call to action without being sleazy?” So, how and when to deliver your call to action without being sleazy? 04:17: So think about it this way, all sales offers should be proportionate to the amount of trust that we’ve earned. All sales offers should be proportionate to the amount of trust that we’ve earned. I think about audience interaction in the same way. Your audience interaction should be proportionate to the amount of trust that you’ve earned. So, for example, on this particular podcast, I can make you an offer, but it needs to be proportionate to the amount of trust that we’ve earned, and my call to action is, if you have not yet, go buy a copy of “Steal the Show,” because you’ll love it, and you can do that at stealtheshow.com, you’ll get some free bonuses if you go there, or you can just hop on over the Amazon or anywhere books are sold and pick up a copy. I feel like I’ve earned the ability to make that offer by giving you podcast episodes five day a week, for free. So I’ve earned that. 05:12: And if someone doesn’t like the fact that I said, “Why don’t you go buy my book?” Well, maybe then they shouldn’t listen. I think it’s perfectly acceptable for people to offer what they’ve created. But most people are cool with that, they go, “That makes sense.” And then for people who’ve read the book, I’d say, “Go over to heroicpublicspeaking.com, and go check out our upcoming schedule of events and online courses.” “That sounds cool.” But if I said, “Okay, listen, I’m doing this $150,000 training, and let me tell you why you need to do it,” and I spent the next hour and a half pitching that to you, you’d go, “Oh, I listen to this podcast because I wanted to get these answers to the particular questions that people ask this week. That’s not why I’m here. And I don’t really know him well enough to consider that yet, so that’s disproportionate to the amount of trust that I’ve earned,” that’s what they would think. And they go, “You know what, that’s a little sleazy.” So the proportionality of the amount of trust that you’ve earned is very, very important. 06:13: So what I’d recommend you do, and this worked well for me for a decade, is at some point of the presentation, when you feel like you’ve earned enough trust, it can be at the end certainly, it could be three quarters in, you might say, “Listen, I do this thing every week or every two weeks or every month, and here’s the topic and it’s free, and I’d love to invite you to come participate. And if you love it, you’ll come back again, if you don’t, you won’t. But it’s free so there’s no barrier to entry, there’s really no risk in it for you, and if you liked what I had to say here, then you’ll enjoy that as well. And I call this the “always have something to invite people to” offer. I write about this in my first book, “Book Yourself Solid”, the “always have something to invite people to” offer. 07:01: And the ‘always have something to invite people to” offer is something that’s consistent and frequent. And that’s important because if it’s not consistent then it’s not an “always have something to invite people to” offer. And certainly it could be consistent but not frequent and then it’s definitely not an “always have something to invite people to” offer because maybe you do it consistently once a year, but if you meet someone on a Tuesday and you just did that particular thing the Monday prior, it’s gonna be 364 days before the next one so it’s not really gonna help move your business forward very quickly. And what I would do in the old days before there was something called podcasting, is I would host a teleseminar, a conference call every Monday at noon Eastern. I called it ‘The Think Big Revolution’. And each week I’d bring a different idea that would help the people that I serve think bigger about who they are and about what they offer the world. And in the first 10 or 15 minutes, I’d introduce the concept and then I’d open up for discussion. I’d say, “So what do you think?” I’d ask them questions about it and then we would start a discussion and it would get really active and very inspired and people loved it, it was really, really fun. And 85% of my business came as a result of that particular “always have something to invite people to” offer, it was that effective. 09:37: And that’s how I think about the sales conversation, that’s how I think about the sales process, and that’s how I think about developing relationships with audiences when I’m giving speeches. Just one step at a time. Just one step at a time. Just one step at a time. That’s it. So thank you for that question Ger, I hope that was an answer that would be helpful for you. Oh, one other thing I wanna say about that. Sometimes people say, “Yeah, but if I do something every week or every month or in your case a podcast five days a week, isn’t that a lot of work?” “Yeah it’s a lot of work, of course it is. But it is the primary way you build relationships with potential clients and customers.” And so you’ve got to earn that business, you’re not entitled to it. I’m not entitled to your business, I’m not entitled to anything, I’ve got to earn it. So I will sit in the studio for hours and hours, days on end, recording episodes for you because I wanna demonstrate that I’m here to serve you. 10:34: And that kind of consistency means a lot to potential customers and clients. They know they can count on you. And when they know they can count on you, then they’ll work with you because your reputation is only as good as your ability to make commitments and fulfill them. Your reputation is only as good as your ability to make commitments and fulfill them, ’cause if you don’t make any commitments, then not a lot happens, nobody wants to play with you. And if you make commitments but don’t fulfill them, then nobody wants to play with you again. But if you make commitments and fulfill them, well that’s how you earn trust. You make another commitment, you fulfill it, you earn some more trust. You make another commitment and fulfill that, then you earn some more trust, and the process continues on and on and on, fantastic. 11:24: And then let’s see, there’s about 50 questions here. Now I lost the third one, I’m terribly sorry, I hope you don’t hate me. Okay, here we go. And I’ll get to all these questions in different episodes over time. 11:41: So Alex Harris who is a designer, he asks, “Should you create one solid talk then adapt it to various audiences, then run with that talk for a year or more?” He said, “I spent a year making one talk good, but I wanna make it great in a year or two, fine-tuning the details. How long is too long to reuse the same talk deck of slides? Curious of your thoughts.” Thanks for the question, Alex. 12:13: Now, this is gonna depend upon your particular situation. It depends on the needs that you have and your responsibilities professionally. So, you may need to give a lot of different talks on a lot of different topics. Say, if you’re out there on the road, giving speeches representing Google, they may ask you to continue to bring new ideas, new concepts, new features out to the world. So, you may need to continue to develop new material, although there will be a base line, there’ll be a foundation that is consistent across all of those speeches, most likely. But if you’re an author or if you are a non-profit leader, or if you’re somebody that is trying to bring a particular idea, particular way of seeing the world, a particular view point, or teaching a particular protocol or curriculum to a target audience, then you can be very well served by building one particular speech around that particular topic or protocol and mastering it. And delivering it again, and again, and again, and again. 13:29: So, I deliver three different key notes. And I’ve been doing this for 13 years. I delivered one on ‘Book Yourself Solid’, that’s my very first book that I wrote in 2005. I delivered one called ‘The Think Big Revolution,’ which is based on ‘The Think Big Manifesto,’ which is a New York Times best seller that came out in 2009. And then, I do one on ‘Heroic Public Speaking,’ and the material in Steal the Show. That’s it, three. 14:00: Now, ‘Book Yourself Solid’ I developed 13 years ago. ‘The Think Big Revolution’ I developed six, seven years ago. And ‘Steal the Show’, I developed over the past year and a half. That’s it. And I don’t say yes to every invitation, to every speech that I get. Right now, I’m doing more speeches that are related to Heroic Public Speaking and Steal the Show because the book just came out. So, that’s the topic that is most relevant to the people that I’m serving at the moment. So, Dan Pink, very well known author. He’ll write a book and then he’ll speak on that book for two years, three years then write another book. Then he’ll speak on that topic for two, three years. And he may speak on previous topics when asked but he’s gonna make that decision at that time. So, generally you can master one thing a lot quicker than you can master 10 things at the same time. When I’m reading a book, I read one book at a time, I don’t read 10 books at a time. Because of course, I’m gonna be able to master the material in that book a lot quicker than if I am just touching on that material once every 10 days rather than reading it straight through. 15:17: So, that kind of focus really makes a big difference. And then of course, other people think you’re more serious. It’s interesting. It’s the opposite of what you might think when you’re starting out. Let’s say you do wanna become a professional speaker or you’re using speaking to serve the model of your business, and so you’re trying to book some business by using free speaking. If someone looks at your website and you have 10 different topics that you speak on, then they think you are the… What’s the expressions? Master of none, something of something you… They’ll look at it, and go “Oh my God, there’s so many different things. How can he be that great at all those different things?” But if you have one or two things that you do so well, then they make the assumption that you’re an expert in that particular area, that you have a brilliant talk because you do it again, and again, and again and they want that particular talk. 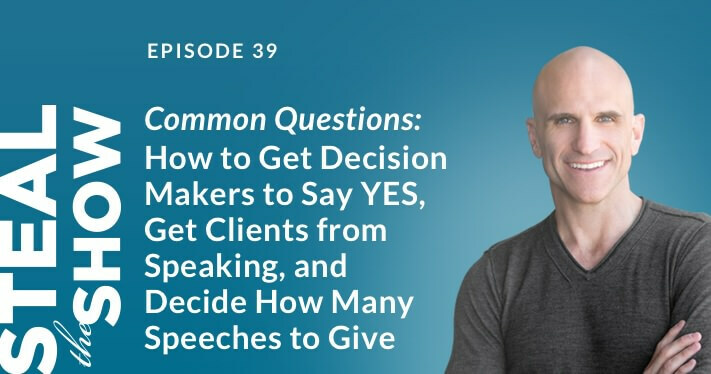 Also, as a slight side note, if you are hired or asked to give a speech based on some video that you showed that particular decision maker, make sure you go in and give that particular presentation. 16:27: Sometimes we think, “Oh, well, I wanna switch it up because I don’t want them to think that I do the same thing all the time.” But in fact, they brought you in to do the same thing, that’s why they brought you in. If all of a sudden you’re doing something different, even if it’s on the same topic, they might get nervous. The meeting planner, the organizer, the association chair, head may go, “Oh my, what’s happening? This is not what I saw on the video. I’m a little nervous.” Even if it’s going well, they might get nervous. So, that’s important to remember as well. There are three, I think, very helpful answers, I hope they were to you, to three excellent questions. 17:05: I don’t know if any of my answers were comical today but I think that’s okay, I think that’s okay. Listen, if you haven’t yet read “Steal the Show”, go pick up a copy. You can get lots of bonuses at stealtheshow.com. And of course, you can buy it anywhere books are sold. If you have not yet, please subscribe, rate and review. Your reviews mean a lot to me. If you got… If you found value, if I was able to help you, then let other people know. Let other people know that there’s value here for them as well. And keep thinking big about who you are and about what you are for the world. I love you very much, not in a weird way. But I love you for being the big thinker that you are, for being the person that will go out there and raise the stakes, who go out there and do their best to steal the show in service of their “ensemble” and the people in the room. Bye for now.